American Airlines: 48-hour fare sale to Brazil. Coach and Business Class discounts. From now through June 7 Brazil is on sale! American Airlines is offering discount airfare to Brazil now at AA.com. Purchase your tickets on AA.com by June 7, 2012, and start travel between June 14, 2012, and July 10, 2012. All travel must be complete by October 8, 2012. Prices shown are each way, based on round-trip purchase on AA.com. Save big on your next getaway to Brazil with special Business Class prices. Purchase your tickets by June 7, 2012, and start travel by August 24, 2012, to save. All travel needs to be complete by August 31, 2012. I did some sample searches from Dallas to Sao Paulo and Brasilia, both inside and outside the fare sale window. The round trip savings for a coach ticket averaged around $500. The savings in business class were between about $1,100. A 7-night minimum stay is required. Reservations are required. Tickets booked on AA.com must be purchased at least 7 days prior to departure, or within 1 day of making reservations, whichever comes first, but no later than 11:59 p.m. (CT) June 7, 2012. Start travel by August 24, 2012. All travel needs to be complete by August 31, 2012. Discounted Coach fares are available from 35 cities, go here to check the price from your city. Discounted Businss Class fare are available from 28 cities, go here to check prices. Feel free to share the results of your fare saerches. Let me know if you find any really great prices. 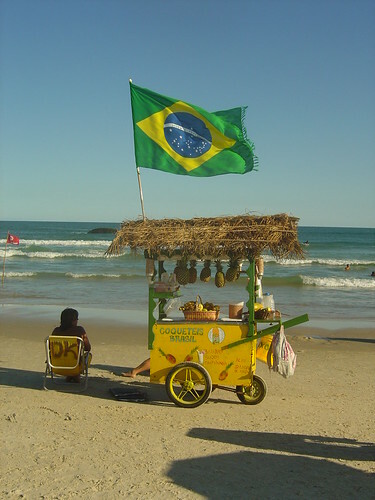 Photo: Praia Juaquina, Florianopolis, Brazil, December 20 2008. 1000X better without the bold. If I could bold the words “1000X”, I would. =P The bold on a white background is pretty harsh on the eyes, especially if you’re reading a whole paragraph of it.